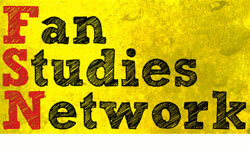 A good recap of the most recent Fan Studies Network Symposium. I really appreciate hearing about other scholars who are talking about and calling for more attention and discussion of the problems and negative aspects of fandom. Their desires align with my own interest in fractured fandom, and I will be looking more closely at what the scholars have discussed on this topic. This weekend I attended the Fan Studies Network Symposium (26-27 September 2014). It was an engaging conference, and I’d love to talk about it some more here about its main themes and sketch some future directions in which fan studies may develop.